This chicken has so much flavor it will blow your mind! 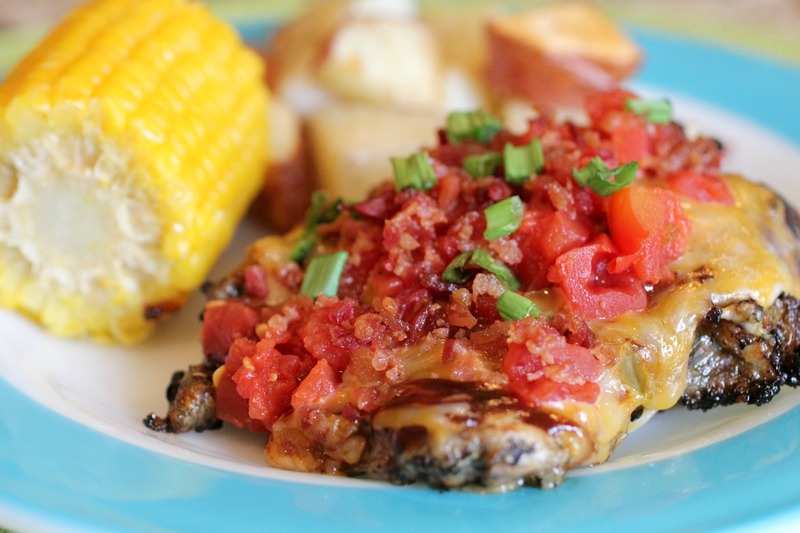 Get this…it’s grilled chicken (already delicious) topped with BBQ sauce, cheese, rotel tomatoes, green onions, and BACON! Do I have your attention now? I thought so. 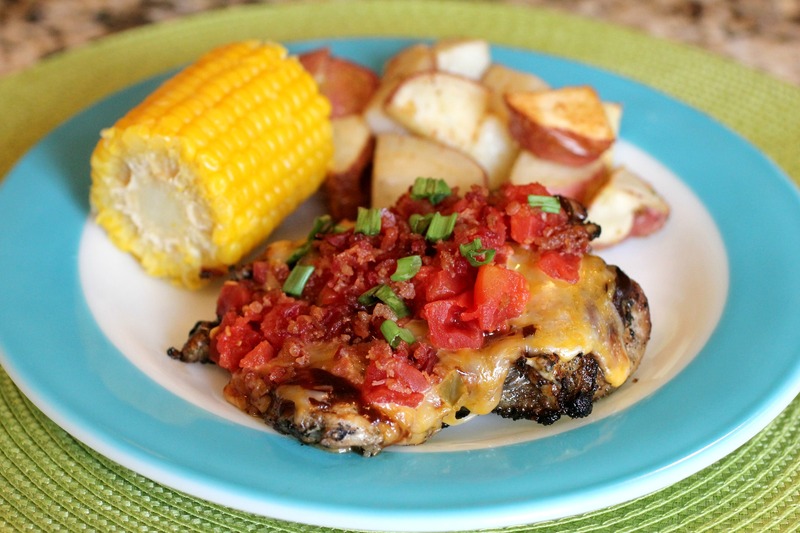 With our very first bite of this chicken, my husband and I knew it was immediately one of our favorite recipes. The ingredient list alone had us pretty excited about trying it, and we were like giddy schoolgirls when it came out of the oven, all cheesy and ready to be eaten. The dish did not disappoint. I will say, however, that there is one small adjustment I will make next time. This is strictly personal preference, but when I make it again, I won’t use the whole can of rotel tomatoes. And yes we did use the mild rotel, but still, it was just a lot. The BBQ sauce alone has a tanginess to it, and coupled with an entire can of spicy rotel tomatoes, it was just a little overpowering. It was delicious and flavorful, but had just a bit to much spiciness for me, and I couldn’t taste all the other amazing flavors as much as I hoped. I mean, I LOVE bbq sauce, cheese, bacon, and green onions, and I’d like for the rotel to back off a bit so I could taste more of the other stuff! Like I said, this is entirely personal preference. My husband for example, loved the spiciness of the dish and would probably enjoy it less if I reduced the rotel (maybe next time I’ll just give him some of mine). But for those of you who aren’t wild about spicy dishes, then you’d probably want to cut back on them, especially if you’re cooking this dish for little kids. Regardless, this is one of our favorite dishes ever because it’s so tasty and really easy to make! 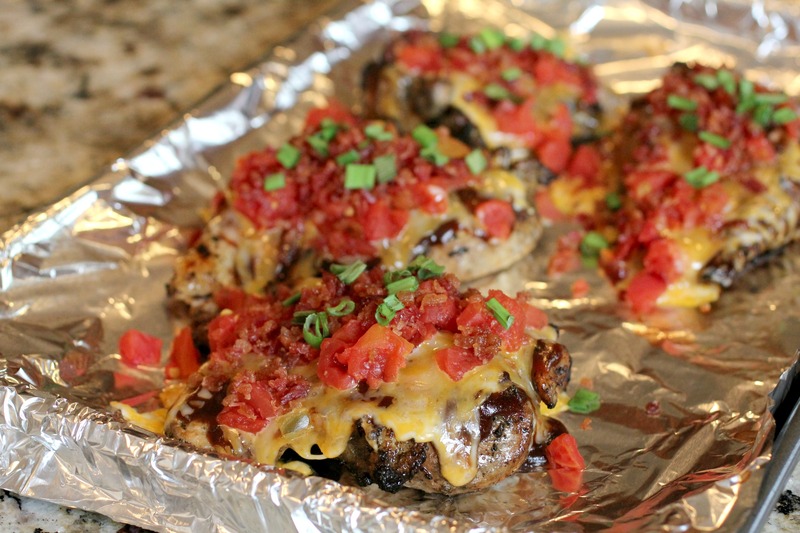 Just grill chicken, top with toppings, and bake for a couple minutes to warm it all up and melt the cheese. It’s that simple! It’s a 30 minute meal at it’s finest. If using marinade, combine olive oil, soy sauce, and steak seasoning. Marinate chicken for at least 30 minutes before grilling. Preheat grill to high heat. Pound out chicken slightly to get an even thickness. Season with salt and pepper. Grill on high heat for 3 minutes on each side to sear the outside. Then cook on low for approximately 8 more minutes per side, or until cooked through and no longer pink. Remove chicken from grill and place on baking sheet covered with foil. 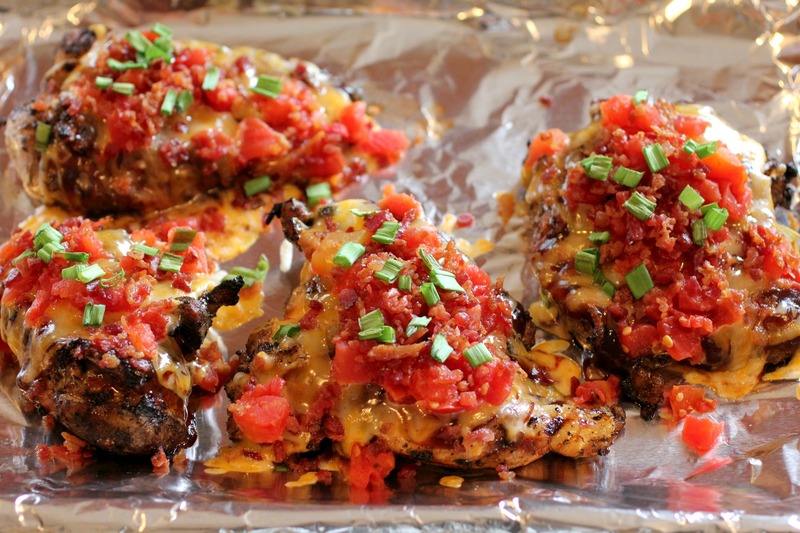 Top each chicken breast with one tablespoon barbecue sauce, 1/4 c cheese, 1/4 c tomatoes, green onions and one tablespoon of bacon bits. Place in oven and bake until cheese is melted (about 5 minutes). What a beautiful recipe. That marinated sounds delicious and I will definitely try it. Thanks Melisa! Hope you like it! This was so amazing. Yeah, I think I prefer more spicy to less spicy, but I can see how reducing the rotel would allow for the other flavors to pop through. Wonderful! Agreed It wasn’t so much that it was TOO spicy It just made me sad that I couldn’t taste all that wonderful cheese, bacon, and bbq sauce because of the rotel hogging up my taste buds. haha it was hard work getting that comment completed! But I do hope that you like the chicken and that it doesn’t dry out! Your chicken looks very yummy .Have a good Memorial Day!!! Thank you! I hope you have a great Memorial Day as well! We LOVED it! Let me know what you think when you try it!